“I do not wish to accuse anyone, nor do I wish to investigate the matter further. I simply wish that art lovers and collectors who collect my works feel free to get in touch with me to verify the authenticity of my works.”- LEE Kian Seng. A suspected fake artwork passed off as created by Malaysian artist LEE Kian Seng’s work has surfaced with the intention of being put up for auction. Lee Kian Seng, the “Father of Malaysia installation art”, who trail-blazed the art scene from the 60s to the 80s, stressed that he had never put that particular piece of work up for auction. He wished to alert art collectors of this matter in order not to be duped into paying premium price for a fake. 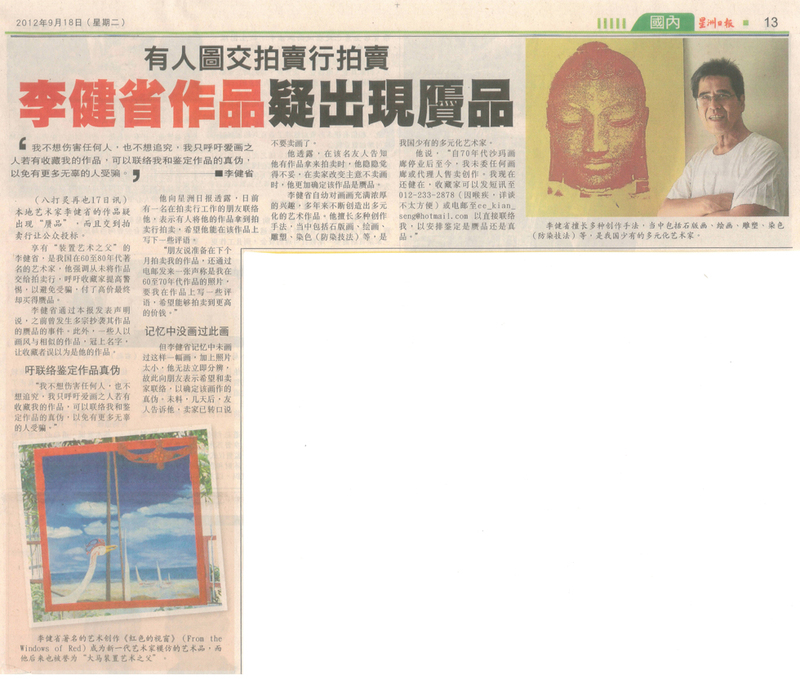 Lee Kian Seng stated that there have been cases of faked artwork in the past, particularly imitations of his style of art passed off as his original masterpieces, thus misleading collectors into believing that they have his original works. He revealed to Sin Chew Jit Poh Malaysia that an acquaintance of his associated with the auction field, contacted him with regards to a so-called work of his which was about to go on the auction block. While getting in touch with LEE Kian Seng to open a few words about the work, the suspicion of the authenticity rose. 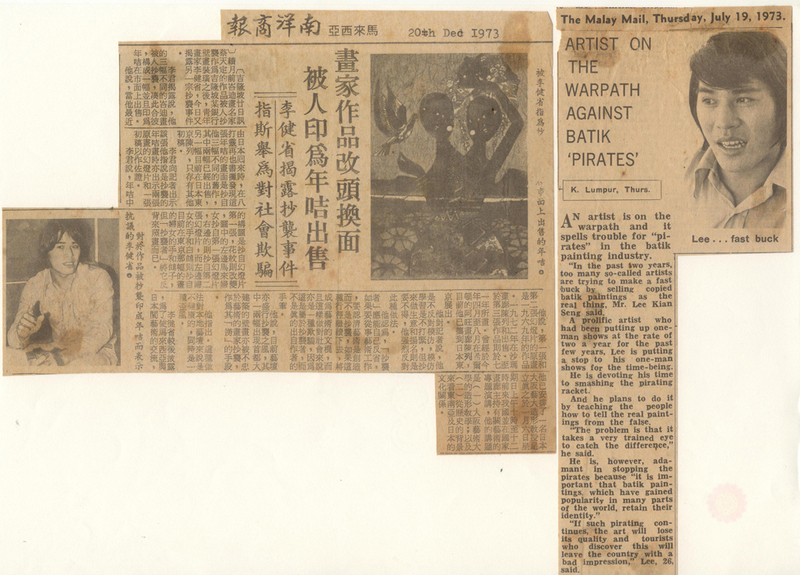 The aforesaid acquaintance stated that prior to putting the so-called work by Lee Kian Seng next month, he emailed the artist a photo of the work (which dated from the 60s to the 70s) and requested that the artist describe something about the work; undoubtedly with the hopes of auctioning the work at a higher price. Lee Kian Seng did not recall having the art piece. Furthermore, the emailed photo of the work was too small for close scrutiny. The artist then suggested that the owner get in touch with him, in order to allow for the actual inspection of the said work. However, a few days later, he was told that the owner had decided to withdraw the said art piece from auction house. Lee Kian Seng revealed that ever since it has been brought to his attention that fake copies of his work could be floating around the local auction market, he felt unsettled, especially when the owner abruptly decided not to sell the supposed work of his at the last minute. He is fairly convinced that the artwork was a fake. Lee Kian Seng is Malaysia’s foremost multi-disciplinary artist. His prolific career attests his passion for art from a young age. For many years he has produced works of great variety and high caliber. His forte includes painting， lithography, sculpture, dye-and-resist techniques, etc.